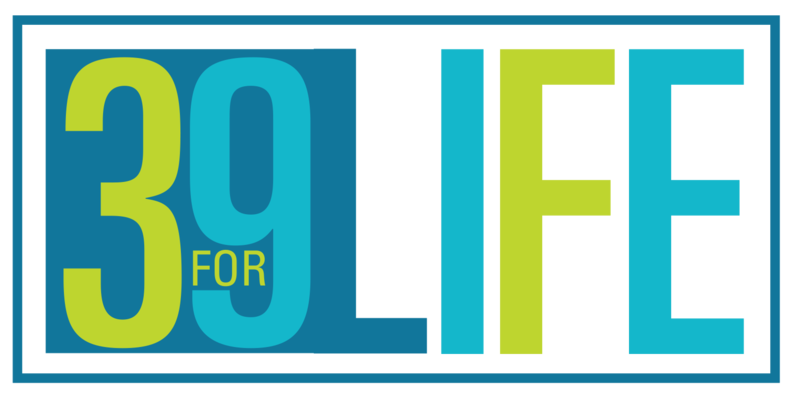 You are at:Home»Lifestyle»Moana Toys and Books – reviews to help your Christmas shopping! With the success of the new Disney film Moana which introduced a new princess to audiences around the world, comes plenty of merchandise, including costumes, figurines, clothing, dolls, and books. These are just some of the fun ways to bring the enchantment and excitement of the movie to your home. 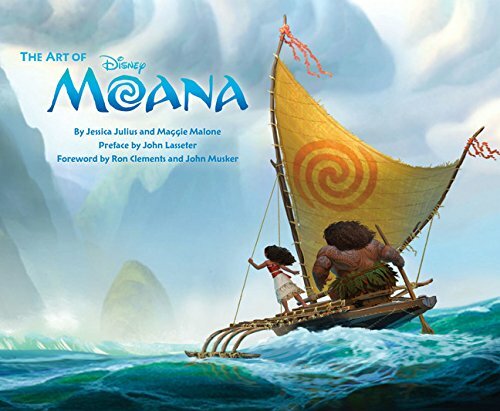 The Art of Moana is a hardcover coffee-table book, filled with amazing images, sketches, digital images, art of all kinds, as well as background information about the film, characters, and items in the movie. Besides Moana (as a toddler and later as a mature young woman), the characters of Maui the demigod, little Pua, Moana’s pet pig, crazy Heihei the rooster, and other characters combine to form this delightful story of courage and destiny. The book is colorful as well as informative. It’s definitely something fans of animation and especially fans of this film will want to have. This is filled with amazing pictures to embrace the beauty of the location and the cuteness of all the characters. The Story of Moana is a book geared for children ages 8-12, however it makes a great bedtime storybook for parents to read to younger kids. The stories of how toddler Moana discovered the wonders of the ocean that ultimately led her to voyage beyond the reef to save her people, and the backgrounds of the various characters combine to create a rounded story of the culture and the story of Moana. There is a page of temporary tattoos that children will enjoy, however the best part of this is the actual stories from cover to cover. Moana and the Ocean is for children ages 6-8. 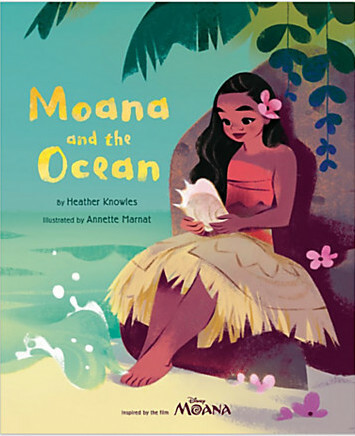 It’s a picture book that tells the story of Moana’s connection to the ocean. Filled with brightly colored artwork, kids will love looking at the images as well as seeing the relationship formed between the girl and the ocean. The Maui Light-Up Fishhook is a fun toy that will be enjoyed by boys and girls and goes great with the Maui Halloween costume. This sculptured fishhook is easy for little hands to hold, although it is a little heavy and a bit wide for very tiny kids. 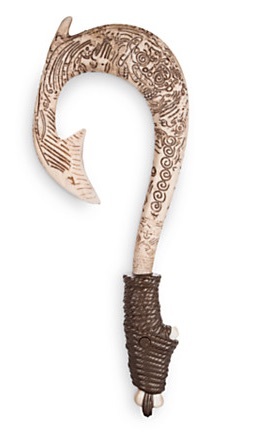 The entire hook measures 18 ½ inches long. 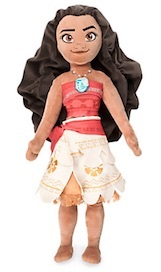 The Moana Classic Doll measures 11 inches high. She is clothed in her traditional outfit and holds her paddle, which itself is engraved with tropical designs. 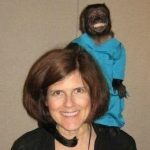 Her long flowing black hair and pose-able body make her a fun doll for kids to play with. She wears her special necklace and presents all the tropical beauty of Polynesia. The Moana Figure Play Set is definitely something that will inspire hours of fun and imaginative play. 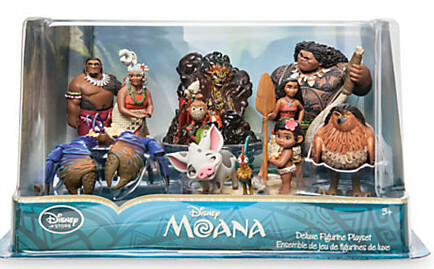 The 10-piece set includes Moana, toddler Moana, Maui with his fishhook, Maui as Hawk (he shape shifts in the film), Pua the pig with Heihei the rooster, Kakamora the pirate, Tamatoa the giant crab, Gramma Tala, Chief Tui, and Te Ka the lava monster. 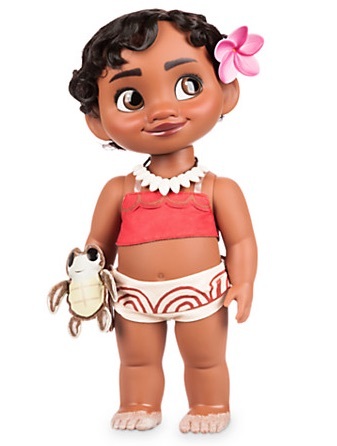 The Moana Toddler Doll wears her shell necklace and holds a little turtle. There is a flower clip for he hair, which is soft and wavy. This wide-eyed girl wears a little crop top and her little shorts. The most adorable features of this doll are her wide eyes, sweet smile, and her feet. What could make her feet so unique? Well, the tops are shiny to reflect the water she just walked in, and her toes and the bottoms of the feet have sand stuck to them. It looks just as though she was playing at the beach and enjoyed every minute of it. Her warm brown Polynesian complexion combined with her dark hair and her outfit makes her the perfect play pal for kids 3 and up. 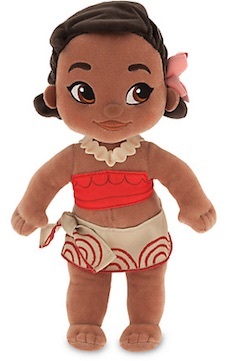 The Plush Moana Toddler is a 12-inch doll ready to snuggle with any child. 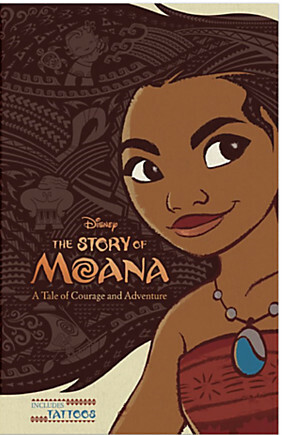 She comes dressed in her Polynesian clothes and wears her shell necklace along with the traditional flower in her hair. Moana’s face is embroidered and her expression reveals the excitement and wonder of this little toddler. There is also an older Plush Moana that is 20 inches in length (height) and is ready for adventure. Moana is not only a princess, but she is also a hero to everyone. This feisty girl really comes through for her people. Like her younger counterpart, Moana plush is made of soft plush with embroidered features. 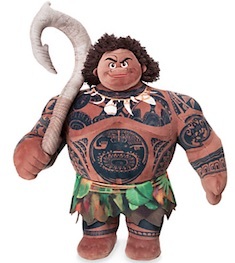 The Maui Plush doll is 15 inches and carries his trademark fishhook and is ready to battle foes. He is also ready for some big hugs. How can anyone resist his wide grin? Heihei is a whacky little rooster who is also ready for hugs from boys and girls. This brightly colored 12-inch Heihei Plush has embroidered features and fluffy feathers. 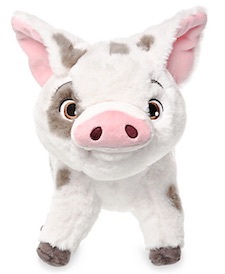 The most adorable plush of the collection is little Pua Plush, Moana’s pet pig. Pua is 9 ½ inches of cuteness. He’s soft and cuddly with embroidered features and an expression that will put a smile on anyone’s face. This little guy will not only be cherished by kids, but also endeared by adults. He’s super cute.